Create a single view app. 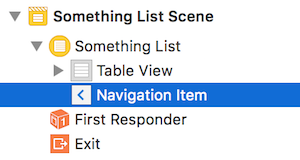 In the project navigator, delete (“Move to Trash”) the ViewController.swift file. With the focus on the yellow project folder icon, create a new file (⌘+N). It will be a Cocoa Touch Class. Next, make it a subclass of UITableViewController. 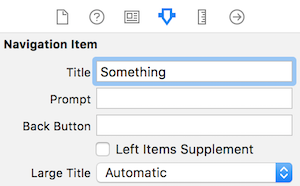 Tip - Use the name “SomethingList” for the class name. Leave out the words “table”, “view” and “controller”. Show the Main.storyboard in the editor. Delete the view controller (scene). Select the just-added navigation controller. On its attributes inspector, check (select/mark) the “Is Initial View Controller” checkbox. On the document outline, in the table view controller hierarchy, select the “Navigation Item”. On its attributes inspector, enter an approprate value for the Title property. Next, select its table view cell object. On its attributes inspector, enter an appropriate value for the Identifier property (something short like “cell”). At this point, the app should successfully build, and show an empty list. Almost always, the source of data for a table view is an array. The contents of the array can be simple Ints or Strings, but most often the array elements will be objects that are based on a custom class. It will have properties for identifier, name, price, and probably some others. A collection of Product objects - as an array - can be a data source for a table view. In the instance variables declaration area of the class, declare an empty array of the desired data type. Then, in the viewDidLoad() method, load the array with data. While it is possible to write code that will create new objects from scratch and append each to the array, it would only be done for quick testing purposes. Instead, use the app’s data model manager class(es) to fetch the data to be loaded into the array. In any app that has a modern design, a data model manager is responsible for managing the app’s data for the benefit of ALL controllers in the app. It knows where the data is stored (in memory, and/or in persistent storage), and it has properties and methods for its supported data service operations (query, add, modify, etc.). In this “example 1, singleton” section, we write code in the controller that calls out to a data model manager. The manager is typically a singleton (which is a “service” object that is created only once and stays accessible in memory). In this “example 2, injected” section, we write code in the controller that receives an injected data model manager. The manager often behaves like a singleton, in that it is created only once when the app loads for the first time. However, a reference to it is passed to any new controller that needs it. Next, in the app delegate application(_:didFinishLaunchingWithOptions:) method, do the following. Note that it assumes that the first receiver of the manager is a table view controller. The tableView(_:cellForRowAt:) method delivers a fully-configured UITableViewCell object to the iOS runtime. The runtime calls this method with a reference to the table view and an index path (section number and row number). Our job is to configure the cell. Make sure that the text string used for the cell identifier in this method matches the value used on the storyboard scene. Next, assuming that we have a one-section data model (and we do for most of our projects), use the index path “row” value to get the object from our data model (instance variable). Then, read what you want from the object’s properties. That’s how it’s done. Best wishes.